Hey, everybody. Don Georgevich here with Job Interview Tools. And today, I want to give you my 5 Best Last Minute Interview Tips. I’m doing this because I get people writing into me every day. They’re like, “Hey Don. I saw you on YouTube and I’ve got an interview tomorrow. What are your best tips? So, I thought I’d make you a video and give you my best tips. Now, this is more of a framework or methodology than a list of bullet points. And even though when you go into an interview, it’s not about saying the right thing. It’s about how you say the right thing. Now, keep in mind that going into an interview and saying the right thing won’t necessarily get you the job. I mean, it will help. It will help keep you on the right track if you kind of get off track during the interview, but saying the right thing in an interview and giving the right answer isn’t necessarily going to win you the job. I mean, an interview isn’t about the right answer so much is like a math test is. It’s kind of different; it’s the way you present that answer. It’s the experience behind; it’s the passion behind your answer. So, there’s a lot deeper things that go into and go into an interview rather than just giving the right answer. But I want to give you my 5 Best Last Minute Tips to help you with a framework and a methodology that’s going to pull you through the interview so that an employer can get a better picture of who you are and what you can deliver to their organization if they’re hire you. So, the first thing I have is ask good questions. Ask good questions to them. This is going to show them that you are thinking and visualizing about the job. Now, you only want to ask them questions that help you make a decision about whether you want to work there or not. You don’t want to ask them meaningless questions. You want your questions to have some value where their answer helps you make a decision about whether you want to work there or not. So, that’s number one; ask good questions that are going to help you decide whether you want to work there. And when they see that you’re asking these real questions, maybe “What’s it like to work there? How are you going to evaluate my performance?” whatever it is; whatever is important to you. You see, what’s important to me in a job is going to be different to what’s important to you in a job. So, that’s why you want to ask questions that make a difference to you, that educate you, where that answer educates you about them and it helps you make a decision about whether this is a place that you want to be or not. That’s the whole point of asking questions. You don’t want to ask questions just for the sake of asking questions. Now, I have a whole list of potential questions that you can ask there in the Complete Interview Answer Guide, but you really don’t need those. You really don’t need those questions. They’re just samples. They’re meant to help trigger you and to help you think of some other questions that might help educate you, but you really don’t need that. You need to think to yourself, what’s important to you in this job and what means the most. Is it travel, like if there’s too much travel, would you take the job? So, if we were sitting down and one of your questions was how much travel was required in the position and they said, “Well it’s 75 percent”. And you know that you’re not willing to travel more than 10 percent, so that employer has just disqualified themselves. You asked qualifying question and in your mind they failed. They failed with their answer because that’s 75 percent. And you know what? That’s too much for you. You don’t want to do that. So, they’re out. You can just exit the interview right there or you can just keep going on for more practice. But I hope you see what I’m driving at. I hope you see where I’m going; in that it’s important for you to ask meaningful questions that help you decide whether you want to work there or not. All right. Makes sense? Let’s go on to number 2. Be flexible: be flexible in the interview, whether it’s about scheduling a follow up interview, meeting some other people, providing them references, whatever it is, whatever they’re asking for. Be flexible, be accommodating. Show them that you are willing. You don’t want to just go in there and if they ask you something, you’ll say, “Well, I’ll get back to you. I’ll let you know”. Give them an answer. Be decisive. And show them that you are willing to accommodate them, no matter what it takes. Because I mean, if you want this job more than everybody else, show them that by being accommodating and flexible with whatever it is they’re asking. Of course, you want to be within reason, but don’t give them a hard time. Remember, they’re dealing with a lot of different people. And so, the more flexible and accommodating you demonstrate that you are in the interview process makes you a more attractive candidate. It really does. All right. So, let’s move on to number 3. Use their language: use the same words that they do. So, when you first apply to the job, grab a copy of that job description, go through it and highlight it. Highlight the different words and the language style that they’re using. Then when you go into the interview, be reflective of that. Because what they’re doing is they’re giving you a peek inside to the way that they think, the way that they write, the way that their culture is and how they name things, and what terminology that they use. So, you have a blueprint of that now. So go in to the interview and be the person that they’re looking for by using the same type of language. When you start using the same words, buzz words, industry terms, they’re going to say, “Hey he’s (she’s) using the same words that we are. They think like us” and you’re showing that you are likeminded. And when they see that a candidate is like minded, they’re like, “Hey, you sound like us, you talk like us, you are one of us. We want to invite you in. We want to invite you into our culture”. That’s what’s going to go through their mind when you’re using the same terminology that they use. Now, you can even take this one step further. Be adaptive, be mirroring. When you’re in the interview and you’re talking to them and you can see that they’re talking a certain way or they’re using words a certain way or they’re using certain buzzwords, terminology whatever, pick up on that. Pick up on that; be detective. Pick up on that, write those things down and try to use some of that language back into your conversation. I mean, do it naturally. Don’t do it in an awkward way, but try to mirror who they are in the interview and you’ll be more like them. It’ll show that you’re more like minded, you’ll go farther in the process and you’ll probably get the job, because again, they’ll say, “Hey, he sounds like us, he talks like us, he probably is one of us. What’s he doing over there? Let’s invite him in over here”. Okay? So, do that. All right. So, let’s move on to number 4. Compliment them when you don’t know. I mean, this happens all the time. We get into an interview and we’re always worried. This is in the back of our mind that they’re going to ask us something that we don’t know. What do we do? Do we sit there? Do we put our thumb on our mouth? We do we shake? Do we look away? What do we do when we don’t know the answer? Well, there’s a great thing you can do. If you don’t know the answer, ask for more clarification. Ask them some follow up questions around their question. And what this is going to do is it’s going to force them to offer more clarification about what they’re asking and they might even ask a less restrictive question that way. It’s a natural thing that we humans do. When we feel that we are misunderstood, we try to clarify more. So, if they ask you a question that you really don’t have any answer for, ask them some follow up questions around that to try to pinpoint what it is they’re looking for and then they will go above and beyond and reply back to you and give you a lot more focus. And they’ll take off some of the boundaries and the restrictions of the question which will make it easier for you to give a more of a direct answer of what they’re looking for. And plus it’s stall time. It allows you to stall a little bit and think about something. Now, you don’t want to use this technique for every question. This is kind of like a lifeline. So, if you feel like you’re stuck and your brain just stops working in the interview, and it does, mine does too. You know, we’re in front of people, the pressure is on, and they ask us something and we just freeze. We don’t know what to do. Have a lifeline. Write it down. Write a little lifeline note to yourself that says, “You know what? Don says if we get stuck, let’s ask a follow up question about their question”. So, then you do that. You ask a couple more questions to pinpoint what it is they’re looking for. They are going to feel like, “Oh, I must not have asked a clear question”. They’re going to feel like, “You know, because my own question wasn’t very clear, now I need to go farther to articulate what I meant”. And this will help you give a more direct answer to what they’re asking for and it gives you a little bit of stall time too; just in case. All right. So, let’s move onto the last one; number 5. Let them know you want the job; just tell them. Most candidates don’t do this. They just think that because they showed up for the interview that that’s all the enthusiasm that they need to express for wanting the job. They’re like, “Well, why wouldn’t they think I want the job. I mean, I showed up here, I interviewed for it”. Now, you need to go beyond that. You need to be enthusiastic. So, after the interview say, “You know what? This sounds like something I want to be doing”. And then be specific; don’t be general. Say, “You know, I want to be working with these customers. I want to be in the industry. I want to work on this project. I want to innovate things. I want to make contributions to what you guys are working on right now”. And be specific; be passionate. Show them that this is where you want to be and this is what you want to be doing, and that if you don’t get it here, you’ll get it somewhere else. But be clear about that. Most people aren’t. When they go in the interview, they just sit there and they just answer questions and they’re like, “Well, did I do a good job? Can I have the job now?” Those people don’t get hired. It’s the people that demonstrate enthusiasm and passion for the job. The people that come alive in the job interview. Those are the people that get the job. Now, granted that’s not going to win you the job every time. I mean, enthusiasm is great. You still need to have other qualities that they’re looking for and they may be looking for more things than just your enthusiasm. I mean, maybe you don’t have any experience at all, but you’re like, “You know what? This is what I want to do. I want to be that astronaut. I can do it”. All the enthusiasm in the world isn’t going to get you a ride on or on a space rocket to the moon just because you’re enthusiastic. There’s a lot more things you need to do. But if you already have the groundwork in place, if you have that experience, you have that education, and you’re enthusiastic about it. That trifecta; you need all three. That instantly separates you from everyone else who’s looking for the job. Because you have the experience, you have the education, and you have the enthusiasm. You have that passion; that drive. That’s how you go farther in the interview. All right my friend? 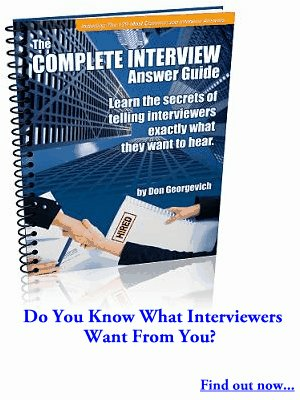 Now, before your next interview, make sure you grab a copy of The Complete Interview Answer Guide. This book’s been around for about 10 years. I wrote it, I developed it. It’s based on my experiences as a job seeker and an interviewer. And it’s got about 140 different questions and it’s going to teach you the right framework to use when you answer interview questions. It’s got all those questions and it’s got questions to ask interviewers too. So, if you’re struggling in those areas on which questions are asked, it will help you there go farther. It’s also got behavioral questions in it. Now, if you go into any interview, you’re going to get hit, maybe 30 percent of your interview is going to be behavioral questions using the STAR method. This book details the STAR method and it’s got about 40 different examples of behavioral questions and answers using the STAR method. So, get this guide. It’s like 50 bucks. You can get it from jobinterviewtools.com. You can get it physical hardcopy, e-book, on MP3 audio, video, whatever you want. I’ve got all the different formats and get this book; just read it over before your next interview. It’s going to help you go so much farther in the interview process. All right my friend. That’s all I have for you today. Good luck on your next interview. And we’ll see you in the next video. Bye now. If you found this video helpful, then give it a thumbs up and make sure you subscribe to my channel so you get notifications every time I release a video. And by subscribing, you support me, my message, and this channel. So, I’d really appreciate it. Make sure you hit “Subscribe”.